Roles are used for grouping Users with similar permissions. In the image below, Jane and John Doe are grouped under the 'Software Developer' Role. 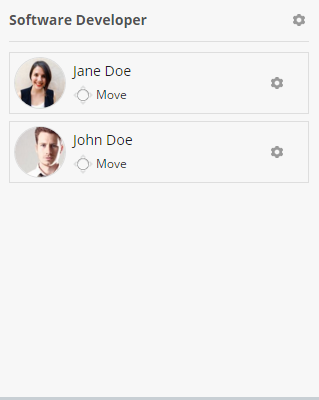 All settings and permissions configured for the Software Developer Role will be applied to both Jane and John Doe. If you add further Users to this Role, the same permission settings will be applied. To start organizing your company's Roles and Users, just head to the Users page. You can choose which Roles have access to the Administration section. To do so, just click on the settings icon near the Role name and click on edit. In the opened popup, enable the 'Admin Access' option. Note: You can’t remove admin access for your Role. When using permissions, you can build a complex system which defines what Users are allowed to have access to. You can control all of your company's Role permissions from the Security page. 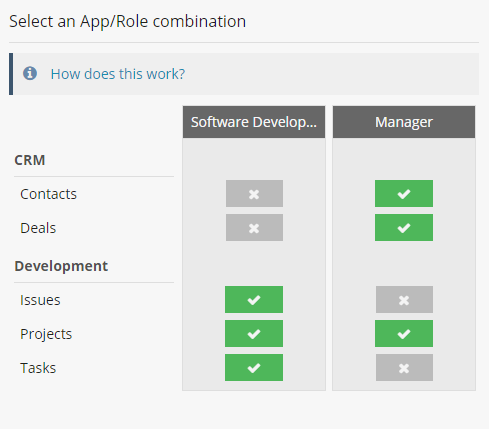 To get started, you need to choose an App/Role combination. You can do so by clicking on the or icons. These icons also give you a quick overview of which Roles have access to what Apps. This means that in the image below, the Software Developer Role has access to the Issues, Projects and Tasks Apps while the Manager Role has access to the Contacts, Deals and Projects Apps. In the image below, the Projects App permissions are being modified for the Software Developer Role. Create, Update and Delete App records Example: You can restrict Users within the Software Developer Role from deleting existing projects. 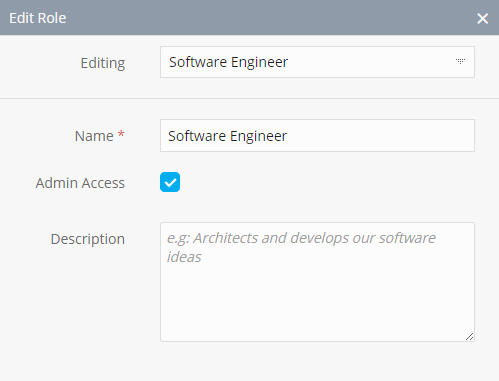 View and Edit specific Fields Example: You can restrict Users within the Software Developer Role from updating the Deadline Field of each project. View specific Dashboards Example: You can restrict Users within the Software Developer Role from viewing the All Projects Dashboard found in the Projects App. However, you would make this Dashboard visible for Users within the Manager Role. Although Lite Users can be grouped in the same Role as Regular Users, not all permissions will affect them. Check out the differences between Lite and Regular Users. When you create a new record, Lite Users will not be able to immediately access that record. Check how to share records with Lite Users. This type of user can never create or delete any existing records within Fusioo. When given access to a record, they can only leave comments (including attach documents) on that record. View permissions work the same way as with Regular Users. You have complete control on the Fields and Dashboards a Lite User has access to.